Both the City of Peterborough Swimming Club (COPS) teams competing in this year’s Fenland League have made it through to the final. The Fenland League is a junior competition for swimming clubs that compete within a 50-mile radius of Wisbech and is held over six rounds culminating in a Finals Night on October 17. The top five teams in the league after the fifth round compete for the Fenland League Cup in the final round. In round five, the COPS A team won their match at Thetford while COPS B finished third in their match at the Regional Pool. At Thetford, James Rothwell (11) started the night off well for COPS by winning the 100m individual medley with a four-second personal best. 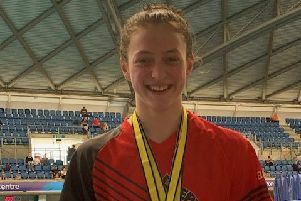 Other event winners for COPS A were: Olivia Bearman-Skipworth (9), Lilly Bourgognoni (11), Jack Brown (12), Oliver Brown (12), Matthew Cussell (13), Bethan Endicott (10), Eriwan Hamid (10), Joshua Martin (9), Toby Norman (10), Amy Paget (9), Bert Papworth (10), Dominic Restaino (9), Harriet Salisbury (10), Stan Scarborough (9), Mia Turvey (9), George Whitman (10), Isobel York-Forward (10). Final result: COPS A 198pts, Thetford 150pts, Mildenhall 125pts, Huntingdon 108 pts, Bottisham 81pts. COPS B winners were: Stella Blakeley (11), Harley Brown (9), Briony Burmby (11), Lucie Creedon (9), Kate McLoughlin(12), Oskar Rajski (11), Millie Ryan (10), Connor Walker (11). Final result: Deepings 169pts, Boston 167pts, COPS B 146pts, Chatteris 97pts, First Strokes 86pts.